The Impact London project was originally set up in 2016 with the aim of supporting HEIs in conducting rigorous impact evaluation of their outreach projects. During the AccessHE Evidence and Evaluation Forum in November 2017, there was general consensus that member HEIs had benefitted greatly from the support offered via this project. Going forward, the focus on evaluating impact from the Office for Fair Access (OFFA) remains high, and is likely to increase under the Office for Students (OfS). OFFA have commissioned four different research projects in the last year related to evaluation. They will expect HEIs to embed the findings in their work. Such research is extremely valuable but also creates another dynamic in the evaluation space for HEIs to deal with. 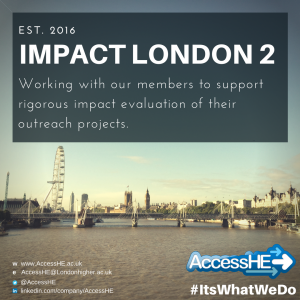 It is proposed that in Impact London 2 AccessHE offers exclusively to members the ability to draw down specialist support in evaluation from AccessHE to help members better demonstrate the impact their work is having in supporting widening access into and through higher education in London. For more information about this project, please contact Dr Tuba Mazhari at Tuba.Mazhari@londonhigher.ac.uk.